These spoons will help keep you out of sticky situations. I bought one each of the slotted and non-slotted blunt end stainless spoons and have been very pleased with them. I have returned to Lehmans website several times in hope of buying more, additional for my family as well as some for gifts, but am repeatedly disappointed to see that they continue to be out of stock! They are excellent quality, sturdy, and made in the USA! Great product. Lehman's says: The item is temporarily on back order...we have more coming! 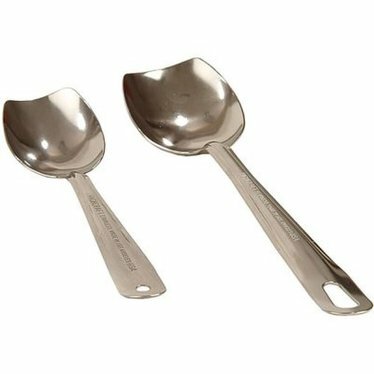 I have used both the slotted and solid steel spoons for years and wanted to gift one of each to my daughter. I have looked in every kitchen store and was never able to find either spoon. I was so excited to find these spoons at Lehman's. Bought all four. Great quality and really keep the bottom of the kettle clear from sticking food. I'm buying more, that's how useful they are. I just got this spoon and my husband and i both love it. it's made in the USA and that is a plus for us. it is well made and i feel like i will have it forever.